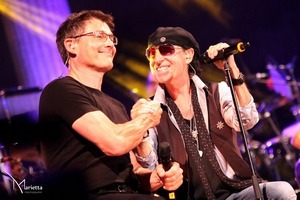 Morten joined German veteran rockers Scorpions on stage at the outdoors Lycabettus Theatre in Athens, Greece last night, to sing the band’s 1991 hit “Wind of Change” together with vocalist Klaus Meine. The live performance can be seen on YouTube. And check out this blog for some good photos from the show. Scorpions are doing three MTV Unplugged concerts in Athens this week (September 11th, 12th and 14th) as “Scorpions & Friends”, with several surprise guests. Morten is supposed to come on stage again tonight, but not on Saturday. Two of the shows are being filmed, and will be released as MTV Unplugged – Scorpions Live In Athens on CD, DVD and Blu-ray later this year. Morten is known to be a friend of Scorpions, and attended one of their concerts while on tour in Russia last year. On Monday he appeared at an Athens restaurant together with Klaus Meine, there’s a picture on Instagram. Marius Beck, who was one of the top five talents on Magne’s team on The Voice last year, recorded his first EP at Kensaltown Studios in London last week. The EP is produced by Magne and Martin Terefe, and is planned for release soon. “Big ups to Magne Furuholmen and Martin Terefe for producing and playing”, Beck wrote on Instagram today. “Marius is a great performer. Ever since the first time I heard him, I’ve been convinced that he’ll go far – be it with The Voice or on his own. His songwriting is continually improving and he’s on his way to something very exciting”, Magne said in an interview last year. Marius Beck’s first single “Back With Me” was released in October 2012 and is available on iTunes.